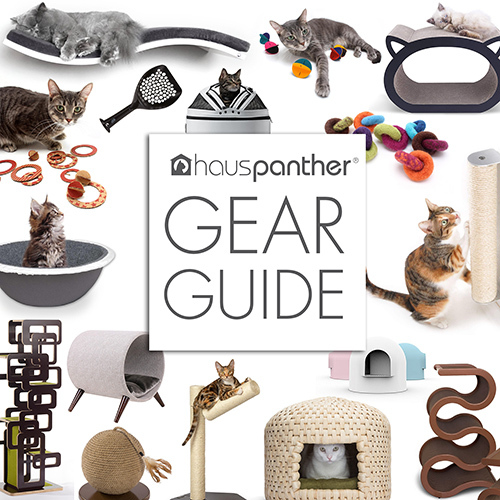 This is a very interesting line of attractive and functional cat furniture from Way Basics. The line includes several pieces, including this sleek litter hider with an easy access door and a litter catcher in the entrance. What’s really unique about this furniture is that it’s made from a special material called zBoard. Way Basics has been making human furniture from zBoard for awhile and this is their first foray into cat products. zBoard is a very heavy-duty, thick-walled cardboard with a decorative paper coating on the outside. It has a lot of advantages over regular particle board, which is usually used in cat furniture. First, it is totally toxin-free and eco-friendly because it’s made from recycled paperboard. It’s also extremely lightweight but strong at the same time. The other unique thing about this furniture is that it assembles entirely with industrial adhesive strips and sometimes wooden dowels with glue. It’s actually pretty amazing how it goes together! They sent me a few pieces to test and I was blown away at the assembly process, it’s really a fascinating use of this material. Another piece in the new cat furniture line is the cat house, a small hideaway measuring about 20″ x 12″ x 15″. The structure has a flip-up top for easy access and it comes in four different paper finishes. This hideaway and the cabinet above are both sold as litter hiders, but I would be hesitant to put a litter box inside a cardboard structure unless you have a perfect cat who never misses the box. I asked my contact at Way Basics, and the paper coating is water resistant, meaning it can be wiped clean with a damp cloth, but you wouldn’t want to subject these pieces to excess moisture, that would be disastrous. I really like their inclined scratcher. This one can be used at a horizontal angle or you can place it up against a wall for more vertical scratching. The scratch pad is reversible and replaceable. If you’re looking for a simple, modern pet stair, Way Basics has two versions, a 2-step and a 3-step pet stair. These are great for helping senior cats or cats with mobility issues reach the bed or the sofa. You might want to add a non-slip surface on the treads, but these are very sturdy and they look great. and they passed the test! Look at these happy cats exploring their new shelf! You definitley need to attach the shelf to the wall before you let cats climb on it, but the shelf comes with hardware to help you do that. The Way Basics cat furniture is available on Amazon and from WayBasics.com. Very stylish and conscious line! Especially like the inclined scratcher. We have one and cats just love it.